Protect your business from unnecessary chargebacks. 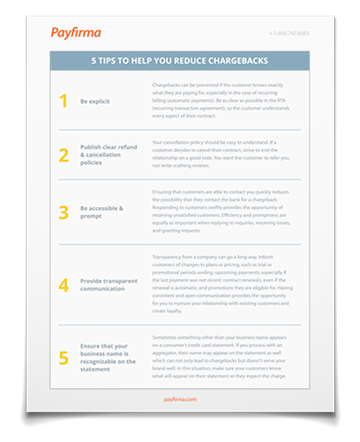 Click to download your free quick guide for 5 tips to reduce chargebacks. Chargebacks are transaction disputes that occur when a customer is unsatisfied with a service or product or feels that a transaction is fraudulent and goes directly to the credit card company to request a refund. However, since many chargebacks are fraudulent, we’ve put together 5 tips to help you reduce your chances of getting hit with chargebacks.